Specialty tape manufacturers are embracing technological development in both adhesive as well as material component. Investment in research and development is also increasing in order to understand what product innovation and development need to be focused on to meet the demand of various industries. Owing to the constant requirement of high-performance adhesives, solvent technology is being used on a large scale. However, water-based tapes and hot melt tapes are also gaining traction in the specialty tape market. Moreover, the use of specialty tapes in the automotive sector is also rising, especially the use of acrylic foam tape has increased as it provides strong bonding to metal and plastic. Meanwhile, specialty tapes are also witnessing growth in medical sector driven by the increasing use of adhesive-based wound care products. 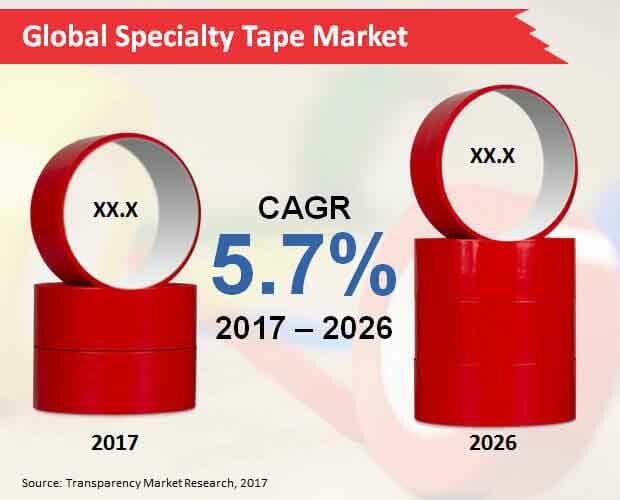 As per the report by Transparency Market Research (TMR), the global market for specialty tape is likely to experience steady growth during 2017-2026, registering CAGR of 5.7%. The global market for specialty tapes is also estimated to bring in US$ 9,907.1 million revenue by 2026 end. Compared to the various types of specialty tapes, woven/non-woven specialty tapes are likely to emerge as one of the top-selling products during 2017-2026. Woven/non-woven specialty tapes are estimated to surpass US$ 1,900 million revenue by 2026 end. Meanwhile, PVC (Polyvinyl chloride) specialty tapes are also likely to show strong growth in the global market for specialty tape between 2017 and 2026. Electronics & Electricals segment is likely to witness robust growth during 2017-2026. Electronics & electricals are estimated to bring in nearly US$ 2,700 million revenue towards 2026 end. Meanwhile, the automotive sector is also likely to witness strong growth in the global market for specialty tape during 2017-2026. The replacement of traditional forms of tape materials with advanced specialty tapes in electronics segment is fueling the growth of the market. Also, specialty pressure sensitive tapes are finding large application in the automotive sector. APEJ is likely to emerge as one of the dominating regions in the specialty tape market. Socio-economic development in countries such as India and China is resulting in the rapid growth of electronics and automotive industry, thereby contributing to the growth of specialty tape market in the region. Moreover, manufacturers are also focusing on improving quality of specialty tapes by hiring skilled workforce and adopting new technologies for better results. Increasing infrastructure development in APEJ is also resulting in the growing demand for specialty tape in the construction sector. However, stringent regulations on VOC emission is likely to hamper the growth of the market in APEJ. Meanwhile, North America and Europe are also likely to experience growth during 2017-2026. New developments in automotive, electronics and healthcare sectors are driving the growth of specialty tapes in North America and Europe. The report provides a detailed profile on some of the players operating in the global market for specialty tape such as Nitto Denko Corporation, LINTEC Corporation, Henkel Corporation, Tesa SE, 3M, Saint-Gobain Performance Plastics, Sekisui Chemical Co., Ltd., E. I. du Pont de Nemours and Company, Intertape Polymer Group, ECHOtape, Avery Dennison Corporation, Scapa Group plc, Xinapse Systems Ltd, Siemens Healthineers, and Toshiba Medical Systems Corporation. Various market players are entering into a partnership in order to offer a better product and to set footprints in various regions. Specialty tapes include a wide variety of tapes for specific use in industries. Hence, these tapes have enhanced capabilities compared to adhesive tapes. With increasing use in various applications, manufacturers are introducing innovative products. These new specialty tapes are made in order to provide high resistance, clean positioning, and better adhesion. The demand for high-resistance tapes has also increased with the rise in number of applications. Manufacturers are increasingly investing in research and development of high-resistance tapes. Various types of specialty tapes are being developed such as anti-slip tape, fire resistant tap, glow tape, flashing tapes with good resistance to moisture, temperature, and UV, etc. With advancement in technology, specialty tapes are also being developed with sensors integrated into it. These sensors can help in detecting force, pressure and strain. The report on the global specialty tape market provides information on the important factors of the specialty tapes market based on present industry scenario, demand, and key business strategies being used by the market players. The report also provides details on factors affecting market growth, including trends, drivers, opportunities, and factors hampering the growth of the market. Analysts have used both primary and secondary research to determine the various factors affecting market growth. The information on the market has been provided using both top-down and bottom-up approaches. The report also offers SWOT analysis, Porter’s five force analysis and market attractiveness analysis. The report on specialty tape market also provides a forecast on market size in terms of both US$ Mn and CAGR in the form of a percentage. The report also offers a comprehensive assessment of factors impacting demand in the global specialty tape market. Key developments in the industry including new technology, product, and added features have also been provided in the report. The report also talks about the regulatory scenario in the market across the globe. The data has been obtained with the help of various market participants including service providers, vendors, sellers, distributors, end-users, etc. The global specialty tape market report has been segmented based on the product type, end user, and region. Based on the product type, the report includes woven/non-woven, PVC (Polyvinyl chloride), paper, PP (Polypropylene), foam (incl. acrylic foam), PET (Polyethylene terephthalate), metal, PA (Polyamide), glass cloth, and PE (Polyethylene). Based on the end user, the segment includes automotive, electronics & electricals, white goods, paper/printing, healthcare, hygiene, aerospace & defense, retail/graphic, building & construction, and other end users. Geographically, the global specialty tapes market is segmented into North America, Latin America, Europe, Japan, the Middle East and Africa (MEA), and Asia Pacific Excluding Japan (APEJ). The market size and revenue for the forecast period from 2017 to 2026 has been provided in the report for each segment, including country-wise analysis. Leading market players in the global specialty tape market have been provided along with the detailed analysis of various parameters such as strategies, product portfolio, financial overview, company overview, and new developments. The leading players mentioned in the report are 3M, Henkel Corporation, Nitto Denko Corporation, Tesa SE, Saint-Gobain Performance Plastics, E. I. du Pont de Nemours and Company, Avery Dennison Corporation, Intertape Polymer Group, LINTEC Corporation, Scapa Group plc, ECHOtape, Sekisui Chemical Co., Ltd., Siemens Healthineers, Toshiba Medical Systems Corporation, and Xinapse Systems Ltd.